The new version of Beamium (ex Slideflight) is now online. Beamium is a startup from Germany, started its web-based online presentation service in the beginning of 2016. Many web design agencies question themselves how to present their web designs to clients. Sending them via email is not really optimal. Sharing a link to any kind of file storage platform probably results in shrinkage or weird font problems on the viewer’s device. Moreover, it is not advisable to send your work beforehand without explaining your considerations to the client. Some experienced professionals recommend to meet in person, to share your screen or to send the link to your designs just a couple of minutes before you call the client via phone. But none of these recommendations makes your life as a web designer easier and your client’s experience satisfying. Beamium makes it now possible to present JPEGs and PNGs easily online, without any installations. Up to 10 pictures can be uploaded simultaneously and presented to your audience within seconds. Beamium, a young startup from Germany, started its web-based online presentation service in the beginning of this year. 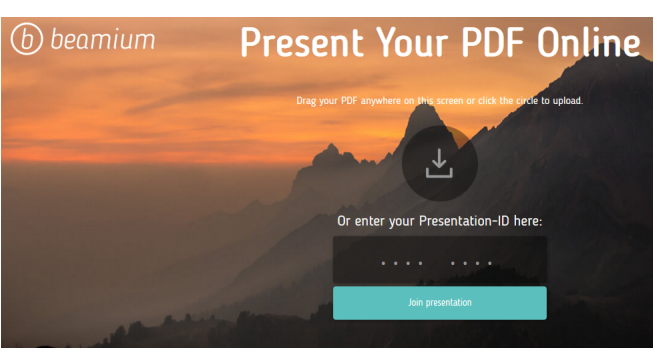 Only one click is necessary to upload your document on www.beamium.com and to start your online presentation. Clients can be invited to join your slideshow directly via a link or via an 8-digit ID which can be entered on beamium.com, in case that you want to share the ID via phone. As a presenter, you are able to guide your audience through the presentation – whenever you move one slide forward or backward, your viewers will always be on the same slide. There are no installations necessary since Beamium works from browser to browser, on any device. You can track the success of your presentation in your personal account and see how often the presentation has been viewed afterwards. 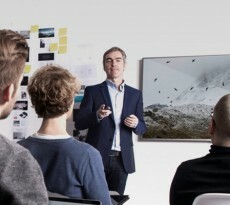 The viewers can optionally be enabled to download the slides as a PDF and details can be highlighted during the live presentation with a simple laser pointer. While Beamium perfectly worked for PDF documents in the past, it is now possible to upload JPEGs or PNGs as well. Simply upload them with one click on beamium.com and start your online slideshow. Nothing more to explain, very easy, and very cool. As you might imagine, Beamium does not only work for web designers. Architects, artists, photographers or even private individuals, who are looking for an easy to handle tool for presenting documents online to a remote audience, can now present single pictures as well as bundled pictures online. No technical skills are needed which makes it easy to present to a less tech savvy audience. Furthermore, Beamium enables you to present from notebooks, tablets or smartphones to notebooks, tablets or smartphones. Is that everything? Well, pretty much. Maybe one more thing: Beamium can also be used for face to face presentations to impress your audience with an innovative presentation tool and share your pictures in real-time with everybody in the room, or on the other side of the planet. We wish you a lot of fun and success at your next presentation with Beamium!